ROME -- Pope Francis says he briefly greeted U.S. presidential candidate Bernie Sanders and the two shook hands, and he describes the encounter as a sign of good manners, "nothing more." The pope says it wasn't evidence that he was getting mixed up in American politics. 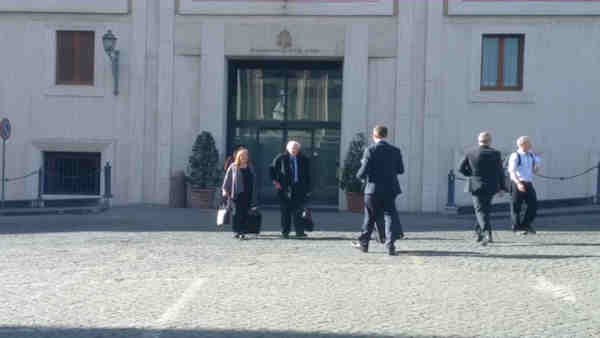 Francis says Sanders - along with Sanders' wife and another couple - were in the lobby of the Vatican hotel where the pope lives, when he left for a trip to Greece on Saturday morning. The pope tells reporters traveling back to the Vatican with him that he decided to greet Sanders and the others because it was the polite thing to do. Francis says, "When I came down, I greeted them, shook their hands and nothing more. It's good manners." The pope then added with a laugh: "If someone thinks that greeting someone means getting mixed up in politics, they should see a psychiatrist."